1 If you hear the word "primitivism," you might think of hairy cavemen chasing wooly mammoths. If you then learn that it was a kind of art, you might think of cavemen swiping spiky brushes across cave walls, painting pictures of wooly mammoths. Primitivism actually was a 19th century art style famous for its exotic scenes and wildlife. 2 During that time, many European countries invaded parts of Africa. These African tribes had a unique culture. Their masks and other art objects looked exciting to the Europeans. The African artists used geometric patterns, animals, and bright colors. European artists saw this and thought Wow, let's paint like this! Soon, they invented Primitivism. 3 This style of art looked flat. The colors were bright. Often, the artist applied the paint in a rough way. Then, the painting looked raw and unfinished. Artists who painted in this style tried to get away from anything that reminded them of modern society. They often painted faraway places. For example, Paul Gauguin painted scenes of natives and beaches on the island of Tahiti. 4 Animals often appear in these paintings, too. French artist Henri Rousseau painted exotic jungles populated by wild-eyed lions, slithering snakes, and brightly-feathered birds. Fantastically lush trees and ferns made his artwork seem mystical, even though he never visited a real jungle. His inspiration came from local botanical gardens, and Henri never traveled to exotic places. But he was still able to capture the magical mood of the jungle in his artwork. 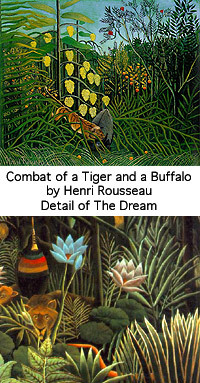 5 Henri Rousseau was unique because he never had any formal training. He came from the working class. His father was a plumber, but even though young Henri liked to draw, his family could not afford lessons. Henri had an ordinary life as a customs official, but he retired when he was 40 and began to paint full time. He supplemented his small pension by giving art and violin lessons. He also painted portraits of neighborhood shopkeepers. Soon, other artists noticed his fine work. Feedback on What Is Primitivism?